This hair regrowth conditioner is the very peak of what can be achieved through the latest advances in biotechnology. Building on the legendary success of Revita ® shampoo, Revita COR® establishes not only a new benchmark for comprehensive ingredient synthesis but also a new technology to keep ingredients working long after hair has been rinsed - for at least 12 hours. The ingredients in Revita.COR® are encapsulated in cationically charged solid spheres that are both hydrophobic and bio-adhesive. This technology means that spheres will stick to the scalp and retain their ingredients for a maximum hair regrowth effect, even during sweating or swimming. Only ultra-premium ingredients are deployed in Revita.COR®, each having been evaluated in clinical trials. It is designed specifically to be used on the scalp and provides significant benefits through its complete mechanism of action on follicle dysfunctions and scalp vitality, along with improved health and structure of hair strands. Uniquely, this product is also a powerful locally acting 5-Dihydrotestosterone (DHT) inhibitor. These properties form a comprehensive formulation that provides powerful hair growth stimulation. 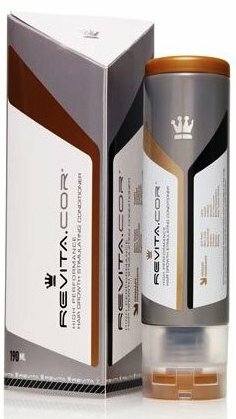 Revita COR® is ideal either as a standalone product or in combination with other forms of hair regrowth therapy. After washing hair with a high-quality shampoo (we recommend one free of sodium laureth sulfate. ), massage Revita COR® thoroughly into the scalp, and leave it on for two minutes. Rinse. For optimal results, Revita COR® should be used daily.